Take espresso, add some hot water and you have an Americano, a wonderful espresso version of the classic drip coffee. Americanos are great because often, you just need a big cup of coffee. The story says that during the World War II in Italy, soldiers from the U.S. would add water to espresso to dilute it and make coffee similar to classic drip. 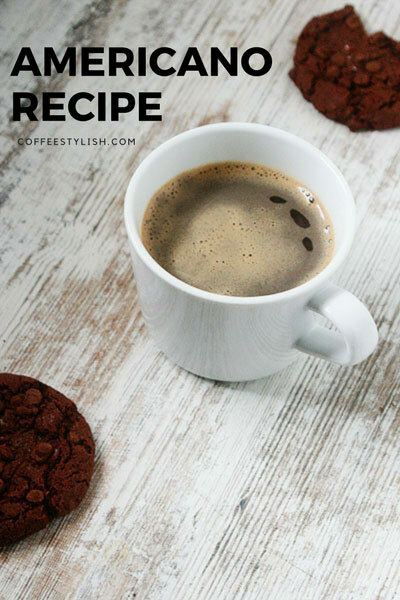 One thing is sure – if you love good black coffee and big cups, this coffee is perfect. An Americano comes together in under five minutes. You pull out a double espresso shot and add 6 ounces of hot water. You can also first pour hot water into the mug and then add espresso. Then it’s called Long Black coffee. Nowadays, many people do it this way because it tends to have more body and crema, but they still call it an Americano. Pour 3/4 cup hot water (right off the boil) in a mug. Pull out your espresso shot or brew 1 espresso pod and immediately pour into the mug with hot water. So simple, so good! Let me know if you try it, and please report back if you land on any seasonal adaptations that you are particularly excited about. Thank you SO very much for the Birthday wishes!